One morning I woke up to find my son building my old 1599 Airliner, which I had left lying around in pieces. It was one of those travel mementos I got back in the 1980s. I helped him out a little (the modern detailed instructions have spoiled him, he missed some not so obvious steps) and then enjoyed watching him fly it around with a giant grin on his face. It made me once again appreciate the longevity of LEGO and how it lasts from one generation to the next. Indeed, some thirty years ago it was me building up my father’s old 1960s LEGO – and my son has played with those too. I got the 1599 Airliner from my 1989 trip to London and according to the interwebs, it was released the year prior. My dark ages began in 1990, so this was one – possibly the one – of my last LEGO sets as a child. What caught my attention this time was the small LEGO brochure, you know the two-sided A4 paper kind that folds into a small square, that fell out from the box of the Airliner in pristine condition. I have written about recent LEGO catalogs, and Internet LEGO catalog repositories before, but this may be the oldest physical LEGO catalog I still have left. I took a couple of photos just for fun. This mini brochure is labelled 101883-EU, has a 1988 copyright, and the set it came with was released in 1988, so it represents the LEGO collection from that year. What strikes me is how foreign the sets in it look to me. During my project to build the 6080 King’s Castle from 1984 I have browsed through countless late 1970s and early 1980s LEGO catalogs on the Internet, and all of them have looked very familiar. I remember sets I didn’t even have, even weird stuff like the LEGO Scala bracelet (and the girl in the picture) looked familiar. Yet this one catalog I still have myself, doesn’t ring many bells. I was fast approaching the dark by 1988. What really brought the point home were the castle and space pictures, where – other than the forest men – the castles and space trains looked completely alien (no pun intended) to me. And it really isn’t hard to see why, when looking at the release dates of sets I know I had, most of the latest ones are from 1986, with the token set from the year or two after. While I clearly still built some LEGO in the late 1980s, the years of drooling over LEGO catalogs were long gone. 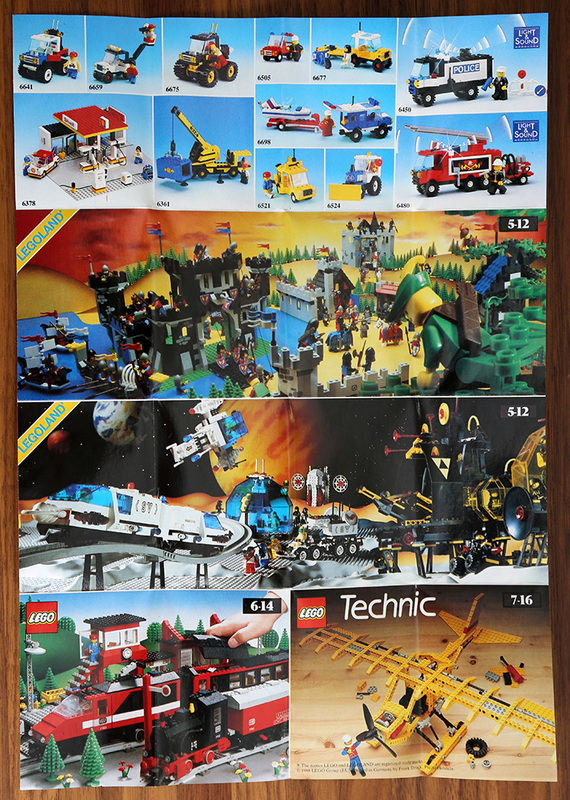 Not that there aren’t any familiar sets in the brochure – many of them were released a few years earlier when I was still active – but most of the big ones I don’t recall. 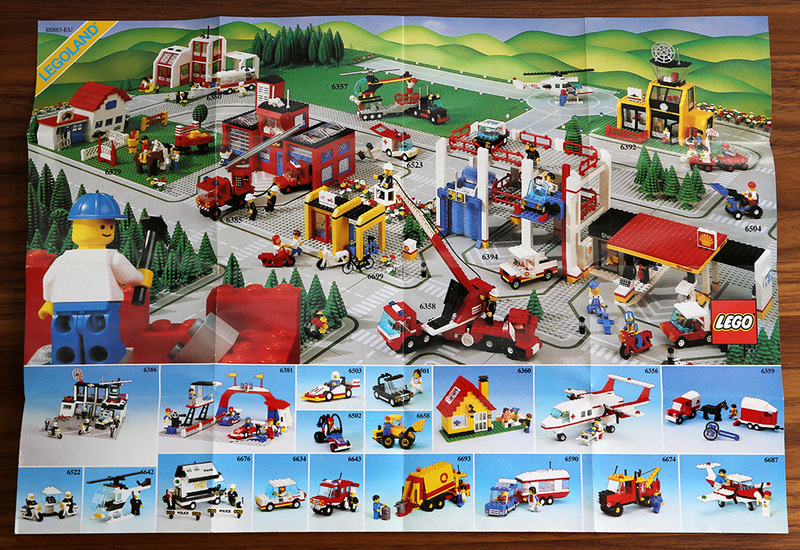 Here is a list of the sets on this brochure I remember having: 6358 Snorkel Squad, 6379 Riding Stable, 6392 Airport, 6480 Hook and Ladder Truck (Light & Sound), 6501 Sport Convertible, 6522 Highway Patrol, 6634 Stock Car, 6676 Mobile Command Unit, 6677 Motocross Racing, 6687 Turbo Prop, 6698 RV with Speedboat and 6054 Forestmen’s Hideout. Mostly small stuff, hinting at diminishing interest. All those I listed were released in 1985-1987, except 6054 Forestmen’s Hideout (1988) which I think was probably my last major set and was likely purchased sometime in 1988. Considering the 1599 Airliner was sold on-board an airplane, and I’m a sucker for such mementos, it makes sense I might have bought it in 1989 even after pretty much giving up on LEGO around 1988. It also jives with the known fact that I packed the collection away in 1990. Not that it interests anyone else, but for my own sake it has been interesting to map out when my dark ages began. I think I now know. Looking at the Brickset lists for new 1988 and 1989 models, none of the sets (with the two 1988 exceptions mentioned above and perhaps a small 1989 racing set) seem familiar at all. The 1990 list would look completely alien if it weren’t for the 8094 Control Centre, which I briefly saw at a friend’s house around 1991 – I remember it got me thinking about resurrecting my interest in LEGO Technic, but the thought was fleeting. By 1989 I was already in the dark, if not quite literally yet (that would come the following year), then at least in all the ways that matter.